We have just started working with a Obersee a new company for us. They have some fantastic travel bags and suitcases and kids’ backpacks. And my son loves backpacks. He has like three of them and wants a new one when back to school season starts. I’m not ready to think about getting him a new backpack but when I am I will be sure to check out Obersee. These are just two of the types of kids travel bags they have. Other kids backpacks include backpack with lunchbox, a toddler backpack and lots of different luggage for kids. These bags are great to have your kids use to travel. Whenever we go somewhere as a family I have my kids load up backpacks. Depending on what type of activity we are doing, riding a plane or taking a road trip they always load up their own travel bags. We also have a coupon code for you. 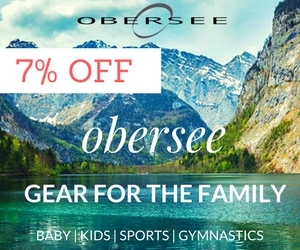 Get 7% Off on All Orders at Obersee.com. Click Here Now.